The regular meeting of the Franklin Town Board was called to order by Supervisor Jeff Taggart at 7:35 P.M. Present were Garret Sitts, David Grant, Donnie Smith, Dwight Bruno, Highway Superintendent Mark Laing and Paul Warner. Also present were Ken Walter, R.A. Cairns, Abby Butler, Tony Breuer, Don Hebbard, Jerry Hebbard, Mike Wallace, Brian Brock, Bill Young, Roger Reed, Tim Robinson, John Cerna and Lisa Huyck. The text version of the minutes in this post was created with optical character recognition (OCR) software. While every attempt has been made to verify the text, accuracy is not guaranteed. Please refer to the PDF version of the minutes in the link below to see an exact version as received from the Town of Franklin. A video recording of this meeting is below. The meeting for the Public Hearing regarding the adoption of the 20l6 Flood Damage Prevention Law was called to order at 7:30 P.M. by Supervisor Jeff Taggart. Present were Garret Sitts, David Grant , Dwight Bruno, Donnie Smith, Highway Superintendant Mark Laing and Paul Warner. Also present were Brian Brock, Tony Breuer, John Alessi, Louise Corsover, Betty Fischer, Mike Wallace, Bill Young, Abby Butler, Ken Walter, Cheryl Petersen, Pete Bevilacqua, Linda Bevilacqua, Don Hebbard, Pete Nero and Roger Reed. There are slight changes in the ﬂood maps. The SEQR form was filled out to indicate that there would not be any significant adverse environmental impacts. David Grant a motion made to adopt the Flood Damage Prevention Law. Dwight Bruno seconded the motion and all agreed. The Public Hearing was closed at 7:40 P.M. The regular monthly meeting of the Franklin Town Board was called to order at 7:35 P.M. by Supervisor Jeff Taggart. Present were Donnie Smith, David Grant, Dwight Bruno, Supervisor Jeff Taggart, Highway Superintendant Mark Laing and Paul Warner. Absent was Garret Sitts. Also present were Roger Reed, Pete Nero, Jamie Archibald, Pete Bevilaequa, Stuart Anderson, Don Hebbard Bill Young, Mike Wallace, Tony Breuer, Abby Butler and Bob Cairns. The minutes were read from the March 1, 2016 Meeting. David Grant made a motion to accept the minutes as read. Donnie Smith seconded the motion and all present agreed. The regular monthly meeting of the Franklin Town Board was called to order at 7:35p.m. by Supervisor Jeff Taggart. Present were Dwight Bruno, Donnie Smith, Garret Sitts, David Grant, Paul Warner, Mark Laing and Jeff Taggart. Also present were Bill Young, Jamie Archibald, Pete Nero, Roger Reed, Elwood Weerheim, Ralph Barlow, Mel Ogden, R.A. Cairns, Tony Breuer, Don Hebbard, John Alessi and Cheryl Sacco Esq. The regular monthly meeting of the Franklin Town Board was called to order at 7:35 p.m. by Supervisor Jeff Taggart. Present were Garret Sitts, David Grant, Donnie Smith, Dwight Bruno, Paul Warner, Mark Laing and Jeff Taggart. Also present were Jamie Archibald, Bill Degenhardt, Bob Miller, Mike Wallace, Tony Breuer, R.A. Cairns, Bill Young, Louise Corsover, Betty Fischer, Don Hebbard, John Alessi, Liz Serrao, and Tim Robinson. Please print this notice in the next published paper. 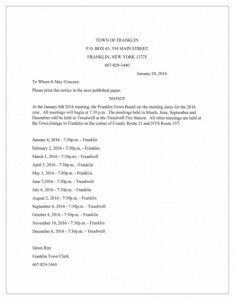 At the January 6th 2016 meeting, the Franklin Town Board set the meeting dates for the 2016 year. All meetings will begin at 7:30 p.m. The meetings held in March, June, September and December will be held in Treadwell at the Treadwell Fire Station. All other meetings are held at the Town Garage in Franklin on the corner of County Route 21 and NYS Route 357.